Wales is currently heading the leader board, unfortunately not in a good way (like for rugby), but for measles infections in the Western hemisphere. Since February, Wales has had nearly 900 reported measles cases, 80 of them hospitalised, and, as feared, now the first suspected death, 25 year old Gareth Colfer-Williams. A lot has been written about responsibility. 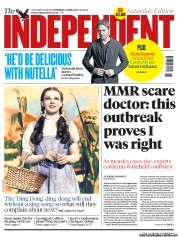 Obviously, Andrew Wakefield came up as the main culprit, who in turn blamed the government for the outbreak, which they rejected. To be honest, to solely blame Wakefield for the MMR mess would be too much credit to the man. The MMR mess is a media manufactuversy as beautifully summarised by Ben Goldacre. And the greed for the headlines has not stopped, and Wakefield is still given front page coverage by irresponsible papers. A high percentage of the children we vaccinate also have allergies and excema which indicate they may not have a perfectly functioning immune system – and even so we have no recorded adverse reactions. The most common side effects (in more than 1 in 10 subjects vaccinated) seen in clinical trials were irritability/agitation and rhinopharyngeal catarrh. Other side effects that occurred in more than 1 in 100 subjects vaccinated in clinical trials were fever >38°C, injection site reaction, rash/cutaneous eruptions, conjunctivitis, nausea, vomiting, abdominal pain, diarrhea. In 2009 a Dr Walker in the USA has studied 275 autistic children and found in a large percentage of the cases that these children had the live Measles virus living in their gut after vaccination with the triple MMR .You can see more about this on the Daily Mail online. We do not use the same MMR or Measles virus vaccine in the vaccine we have chosen to use. At this point already, I know I am never going to entrust my child to this clinic. The Daily Mail as a source for medical information? Honestly? The article they mean is the one previously bemoaned by Liz Ditz to have been posted without time stamp. Everything else is false, too. Steven Walker's work was presented as a poster at the IMFAR conference in 2006, so no "study", not in 2009 either. The abstract reports on results of 82 kids, 70 of them supposedly had measles vaccine virus in the gut. They tell us they have samples of >275, but have not analysed them all. Also, we know since Dr Bustin's testimony to the Autism Omnibus proceedings and Hornig et al that measles virus has not and cannot been found in the guts of > 80% of autistic children. I think this claim "We do not use the same MMR or Measles virus vaccine in the vaccine we have chosen to use" is a lie. We already know that the clinic have not looked at Walker's data, since they misrepresent his findings. There is actually no way the people at the clinic can know what vaccines the children Walker looked at had received, because it is not reported in the abstract and a full paper has not been published since 2006. Given that Arthur Krigsman is the senior author of the abstract and children have been flown to him certainly at least from the UK, it is not clear which measles vaccine strain they had been vaccinated with. The French Rouvax, CIC are offering contains the Schwarz strain, which is also the measles strain used in GSK's Priorix, often used in Europe, the Indian Sii M-Vax, also on offer at CIC contains the Edmonston-Zagreb strain, also contained in the Swiss MMR-Triviraten (Berna) (CIC also import vaccines from China and Russia, if someone knows what vaccine strain is in those, email me). No Autism in over 10 years and amongst 18000 Patient Record Cards?! That is an outstanding record and it sounds dangerously like a "warranty" (I am not a lawyer, but a lawyer friend of mine pointed this out). Absolutely amazing, especially given that autism/ASD prevalence in the UK has been published to be 1 in 67, so they should be looking at about 282 patients on the spectrum, give or take a few. The reason for their "Clinic Highlight" might be their rather unorthodox method of assessment... "We [the clinic] ask you [the patient] tell us if you have an adverse reaction within a few days of the vaccine." 9) CIC is not judgmental about parents’ choice of vaccine (any vaccination ,generally ,is better than none) nor does it have any preconceived ideas as to the causes, be they single trigger(s) or perhaps even several different combinations of triggers. The emotional and financial burden on the family, the limited funding of the UK’s Health sector all point to potential benefit of further timely research into those specific cases which may then be identifiable as being preventable An unencumbered choice for either single or multivalent MMR vaccine options would do less harm than the current situation of a large portion not willing to engage in any vaccination programme. Goodness, somebody save them from themselves. CIC are in a hole, they should stop digging. If they wanted to keep up the illusion that they are there "to help" instead of setting up shop in Swansea in the middle of an outbreak and charging full price for their services, maybe they should have offered their singles at cost? Just to maintain the illusion that they weren't hell bent on keeping the MMR autism lie alive for their own business interest? Just an idea. Love it: "when you purchase your first car seat, they don't tell you that boosters are required. Until they make a car sear that lasts a lifetime, I will never buy one". I can just imagine the indignant tone. Cue someone who points out that car seats are "not injected into the blood stream". Public Health Wales were warning that this would happen, now they are investigating the death of a 25 year old man as the first measles fatality in the current outbreak in South Wales, which hit 808 reported cases yesterday. Updated (19/4/13 5pm): Public Health Wales have confirmed that the man who died in Swansea yesterday did indeed have measles. Ok, I admit, I am vain, and that section did generate a squee. The whole article is worth reading though, very well researched by Alex Hannaford, who is not shy to call Wakefield's operation what it is "Autism Inc.", a money generating machine. Hannaford tried to proffer Wakefield's (and Polly Tommey's) comments, but they only sent their lawyers' roboresponse (Wakefield did not fabricate data, there is such a thing as autistic enterocolitis, yada yada). Instead, he interviewed (among others) the lovely Autismum Martine O'Callaghan, founder of the cwtch-network, whose autistic son Cledwyn is just as lush as Michael Fitzpatrick's son James, and Ari Ne'eman, founder of the Autistic Self Advocacy Network. Not surprisingly, they emphasise the need to improve quality of life of autistic children and adults, by appropriate services (for example schools). Excellent article - read it. and feel free to add research you think we may have missed to discuss. Can I ask though that instead of just dropping a link into the comments, or basic copypasta from the usual anti-vaccine conspiracy sites, you leave one article at a time, with a proper, i.e. retrievable, citation and a blurb in your own words (much as we did in those blog posts) stating what was done in those papers and how this supports the "vaccines lead to gut damage leads to autism" notion? Cheers.